They said walking & jogging is good for bones, improves the body's cardiovascular system, burns calories and a lot more things. But they never said it even makes new friends for you. Many of us don't have companions to go jogging with. As a result, mostly we tend to ignore the activity completely. Yes, we might sweat it out on a treadmill but the joy of walking and jogging in a lush green park, breathing the fresh morning air is something very different. That's where BTC's idea of walking & jogging on weekends came in handy. 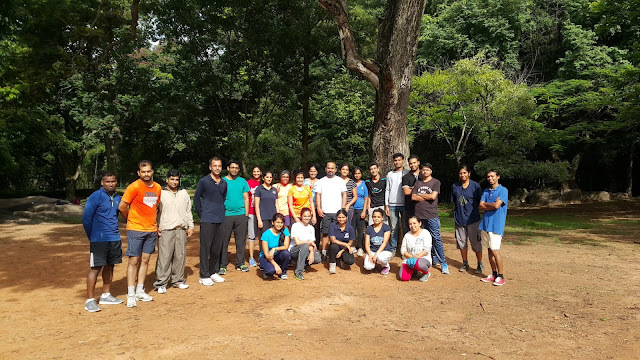 Just like the treks, 24 strangers came together to walk & jog together at Cubbon Park on 25th June, 2016. The organizers, Raksha & Ankit, gathered all participants at the Metro Station Gate of Cubbon Park, took a quick head count and started the walk around the park with the group at 6:30 AM. The group was a mix of 1st timers and regular joggers with BTC, and hence guiding the group along the path was a cake walk. Soon after people completed their 1st lap walking, they started their jog on the same path. Going at their own pace, some jogging the whole 5.5 Km, others taking turns at jogging and walking, the group completed the 2 laps by 8:10 AM. This was followed by some free-hand exercises where Archana led the way in the beginning and Jyothi put a foot on the throttle to take the tempo a notch higher towards the end. The event ended with an all positive feedback, requests to continue the event on all weekends and the group pic before everyone dispersed towards their next destination with a promise to meet again next week. Five of these participants zipped through the scarce Saturday traffic towards the next event: Plantation Drive at ASC Centre, near Ejipura Signal. Yes, they had taken some healthy steps for their body, it was time to take some steps for the future. A plantation drive might not bloom into a forest just immediately, but that's the only way that we can leave greener patches of earth for generations to come. The plan was to plant over 2500 saplings. The pits had been dug, saplings placed beside them. The 5 joggers reported to the BTC organizers: Arun & Kamalesh, who were by now prepping the team of around 50 BTC volunteers and giving a demo for the plantation. Once done with the demo, armed with a box cutter, support sticks & a spade, they formed teams of 3 and got down (in the pits) to work. 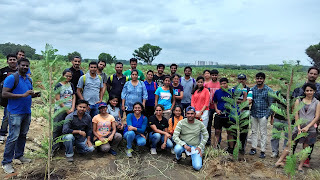 The mass gathering of over 350 Volunteers supported by around 100 army personnel went about with the whole process one plant at a time and in no time, all saplings had been planted hence sparing time for some snacks. The army personnel were very cordial in going around and asking each and every volunteer to take a break for snacks and tea. 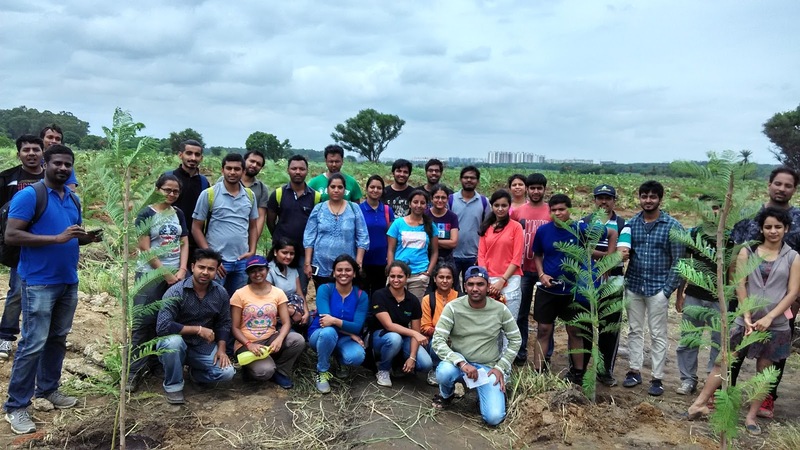 Once done recharging, the challenge of watering the 2500 saplings was taken with great courage and teamwork. Though it took well over an hour, 4 water tankers and all their courage, the task was accomplished amidst huge encouragement and cheers from one and all. There were volunteers from all phases of life, from 6 yr olds going around adding manure to the saplings to 60 yr olds passing bucket after bucket of water for the plants, and also the lazy ones who only carried empty buckets back to the tanker. Though, the group of foreigners visiting India for just a couple of weeks, who took time and volunteered throughout the event, do deserve a special mention. Once done with all activities, the BTCians gathered around their organizers for the feedback and dispersed with a huge smile on their faces. All in all, from Walking to Jogging to lending a hand in making the earth a greener place, it was a day well spent. Oh wait, just half-a-day well spent..! !